Developed with firefighters and paramedics in mind, these wildland and EMS boots can take you to the front line and back with the comfort you need when logging long hours in the station. A dual purpose leather fire boot that is NFPA certified, you have the convenience of two boots in one. The HAIX® Airpower XR1 is both waterproof and breathable with the added benefit of chemical and bloodborne pathogen protection. Working in tandem with the HAIX® climate system, your feet will stay dry, comfortable, and protected, thanks to these leather fire boots – even in times of extreme exposure to water. The Airpower XR1 offers all of the HAIX® quality you have come to expect for long lasting comfort and durability. The upper material of these European leather fire boots uses Sun Reflect technology, which reduces the solar heating effect and keeps feet cool by reflecting the sun’s rays. The soles of the HAIX® Airpower XR1 are extremely slip resistant which offers an effective grip when exposed to water and oil. So even when you’re on a rescue and you’re running on tile, hardwood, or linoleum flooring, these leather fire boots will be able to grab hold. The insoles are anatomically formed to deliver a perfect fit and are made to provide excellent moisture absorption and as well as quick drying qualities. When your insoles get completely dirty after long days on duty, all you need to do is throw then in the wash, air dry, and they’ll be ready the next day’s work. Related links to "HAIX Airpower XR1"
Customer reviews for "HAIX Airpower XR1"
These boots are amazing, they're all I wear I'm on my 12th pair. I am a metal fabricator and I have convinced all of my coworkers to wear these boots at work. I buy a new pair every year and wear them all day every day. So, I guess I've worn only Haix R1 or XR1 for at least 12 years. I've appreciated most of the changes the R1 and XR1 have gone through and was thrilled with the more recent changes. The boot is perfect. Unfortunately with all the good changes made to the new zipper, the new zippers unzip them self's all the time. They are lazy. I am constantly zipping up my boots now where as the last model would get jammed but for the most part stay up. Why didn't you use a locking zipper!? My pants zipper never unzips itself. When the pull is up it moves easily, when it's down it's locked. Also the velcro on these does nothing but get lint stuck to it. The old ones stayed up, what happened? I am half way through putting old zippers on my three month old boots right now. It kills me. I really like these boots but the zipper pulls have broke and stitching is coming apart the edge of the toe cap has separated as well these are pretty expensive I would like to see them hold up a little better. Thank you for taking the time to review the Airpower XR2. We are glad to hear that you like the boots but we apologize that you had some issues with the zipper pulls and the stitching around the toe cap. Please fill out a warranty claim, and someone from our Customer Service Dept. will get in touch with you. We hope we can find a reasonable solution to this issue and that you will remain a loyal HAIX customer in the future. I was so happy to have oreder my first pair of HAIX boot, but when they came in the didnt quite fit right. I was pleased to see they already had a return label ready incase this happens! They were returbed with no issues and I was able to order another pair that were perfect! Super comfortable boots! Fit perfect. Zipper/lacing system is great once you get it set up the way you like. Seem to be very well made. These are great boots for the fire service. I got these to wear while driving and going on EMS runs where bunker gear is big, bulky, and dirty. These boots are amazing g. Despite being a little on the heavy side, they are very comfortable to wear... even for extended periods of time. The zippers are great but I just wish there was an easier way to keep the strings tucked away. Either way, these are great boots and I would recommend. Over the last 8 years or so i have worn Haix boots. Both station and structural. I recently switched to another brand (which i won’t name) which i was happy with for the first 6 months. Those fell apart on me. Couldnt be more happy with the fit and durability of HAIX products. I will never wear another boot. I am a Public Works Operator in the 2nd largest county in the US. Each day could see me in an open cider pit, a working asphalt mix ring (cake ring), wastewater treatment facility and any of the 276 miles of dirt and cider roads we maintain in my district. We respond to Emergency Management (DEMA FEMA, State and local) requests for equipment, personnel and resources during floods, Wildland fires, and other emergency incidents. We are also responsible for the snow removal on all county roads. We get 100+ inches of snow per year on average. I am, as is my wife, a volunteer firefighter in my hometown. A majority of our calls are vehicle incidents ( rollovers, crashes, semi fires and such with extractions being common) and Wildland or brush fires. Finally my wife and I live off grid, by miles. No services. No paved or agency maintained roads. We have land in the transitional area between a desert and mountain range. This is where we are building our home ourselves. I destroy boots of every make and brand. None have lasted a full year even when alternated with a second pair weekly. I cannot buy a cheap pair of boots because of the MSHA, OSHA, NIOSH, NFPA, Wildland fire and County requirements my boots must satisfy. Just finding a pair that can meet ALL of the mandatory requirements in no easy task. Name a brand, it's likely that I've had 'em; loved them, hated them and always wrecked them. Now, this is my first pair of Haix Airpower XR1s. Out of the box, I am impressed. They fit good, feel good and I'm encouraged by the construction of the boot as a whole. My wife even wants a pair, I have high expectations! That being said, I will update this review with pictures and text throughout the life of these boots. So far, I have nothing but praise for them. Everything about them says “I'll be there with you and protect you!”. ZIPPERs are the achilles heel of this model boot! $300 for boots I can't use unless I spend more money!!?? Thank you for your feedback on the Airpower XR1. We apologize that you have had some issues with the zippers. After reaching out to you via email, I believe we found a solution that will keep your boots on the job in the future. We hope they will serve you well and this will not deter you from considering HAIX again in the future. Stay safe out there! Hands down the best boot I have ever purchased. I purchased a brand-new pair of these boots about 2 months ago, after retiring my last pair of the exact type of boots. My last pair of Haix were 3 years old, and had been heavily used not only inside but also outside of work. My primary use for these boots were for working on an ambulance, but they were also used for around the yard and hiking as well. I currently still have and use my old pair of Haix, but as said before I use them for work and currently are showing signs of wear and tear. Personally, before my Haix a regular pair of EMS boots typically last me a year with normal use before I had to toss them away. I have worn Bates, Timberland Pro series, and 5.11 and neither one of these brands can touch the durability and comfortability that Haix offers. These boots have great ventilation, and keep your feet semi dry and comfortable. After 3 years of constant wear with my old Haix's , (as weird as it is) not even the slightest odor can be smelled from the boot even after a hard day’s work. If you’re interested in this boot, I would recommend the composite boot. The steel toe is great, but the composite boot is significantly lighter. This difference can be felt when switching from one to the other, and helps with long days on your feet. The only down side these boots offers is the zipper. The front zipper design is great, and I really enjoy the little effort it takes to get in and out of this boot, but that’s about it. The zipper catches on the inside extra leather strapping that sits directly behind the zipper. I typically cut the leather over hang with a pair of trauma shears to stop this from catching (which does help out a lot). Though, when you need to put your boots on in a hurry for a fire or EMS call, you're just wasting valuable time trying to get the zipper unstuck when you should be on the road. The other issue I have with the zipper is, the velcro. Like I said, I have brand new boots and after each call I’m constantly kneeling down to pull up the zipper that has fallen down. The velcro is a great idea, but it’s almost like it's to high up to or not enough velcro to keep the zipper in place. During different movements, the zipper comes dislodged from the velcro and causing the zipper to come down. This then opens up the possibility for injury, or just becomes annoyance after zipping it up constantly. Overall it’s a great boot, and the best I’ve ever worn. I will continue to wear them, and I would recommend this boot to friends or people within the same line of work. We appreciate your feedback on the Airpower XR1. We are glad that these are the best boots you've ever owned and they have served you well out on the job. We are also happy to hear that these boots are comfortable and durable compared to other brands you've worn. We do apologize that you have had issues with the zippers but I believe we have found a reasonable solution and we hope you will continue to be a loyal HAIX customer in the future. Thanks again for sharing your thoughts, I will be sure to pass this along to upper management for consideration. Excellent boots, very comfortable. Worth it! Great fit, very comfortable. The sizing suggestions given by the company (I.e Airpower XR1 boots tend to fit a little slim so it is suggested that you buy one size larger in width) were accurate. I thought these boots would take a lot of breaking in but they were comfortable as soon as I put them on, no pinch points or anything. Very lightweight and well built. Cannot recommend them enough. I've had these boots for a little over a week and can't believe how comfortable they are. When I first put them on they seemed tight but within an hour or so it was like i had worn them for weeks. Great fit I would say they run true to size. I did have trouble with the zippers but when I read the material that shows how you should angle your foot to pull the zipper up and down have had no additional problems. (read the literature that comes with the boots). I also have a pair of bunker boots by Haix the Fire Hero Extreme . They are also the most comfortable boot that Have had. BEST BOOTS I HAVE EVER WORN! With over 15 years of fire and EMS experience, I feel some would say I am an appropriate appeal to authority when it comes to station/work boot opinions. I have owned Danners, Wescos, Thorogoods, Whites, Redwings, 511’s, Pro Warrintons and now Haix. The Haix XR1s are by far the most comfortable boots I have ever worn. Straight out of the box to years down the road, the XR1s felt like a tempurpedic mattress for my feet. They’re durable as any boot I have worn, half the price of my Whites, actually waterproof-from my many encounter with submersion in water, and hold a mirror like shine around the toe. Many people I see with these boots fail to take advantage of the rubber wrapped toe and give up on shining it to a mirror like finish because the rubber takes the parade gloss differently when compared to the leather. Slow and soft circular motions with water applied in between coats helps the polish hold to the rubber and lasts just as long-if not longer, than the leather. I’ll try to post a photo-if possible. I have read many reviews about the zipper problem with these boots... I haven’t a clue what these folks are talking about. The zipper on these boots are one, if not the best zipper system I’ve ever experienced on a boot. I don’t know if they fixed the problems of older zipper systems because I’m sure these people aren’t telling a tall tale, but I have not had a single problem with the zipper system or the boots in their entirety since owning these boots. THEY ARE THE MOST WELL MADE, WELL ENGINEERED BOOTS I HAVE EVER OWNED. I’m shocked that I spent over $600 on a pair of whites in the past and were nothing compared to these boots. (Hine sights always 20/20) but for $300 for this level of quality is insane. BUY THESE BOOTS!! YOU WILL NOT REGRET IT!!! First time Haix buyer. I had a question concerning sizes, I know my European size is 100% accurate (I highly recommend you know your Euro size), and wanted to make sure I purchased the correct boot size from Haix. I was greeted by a wonderful young lady who answered the phone. Yeah, a real person not a computer! She transferred me to Jennifer, who was wonderful and super helpful, really knowledgeable on Haix products. She tried to find me the best boot to match my needs, not pushing more expensive products, she wanted to know what I was using the Haix for, and she wanted to match the perfect boot for my needs. Refreshing!!! No pushy sales people. She matched me down to three boots, actually suggesting the cheapest of the three to be my best match. She took my Euro size, and had me matched to the correct size I needed. Perfect fit, and glad I called! I had a question regarding one of the boots; so she tore one from stock apart, called me back and gave me the details while walking me through a diagram from website and explaining things to me. Impressive! Well, I just got my HAIX Airpower XR1. The boots came with an extensive 40 page training/info manual. Impressive! Now I have the perfect all purpose Flight/LEO Duty/SAR/Wild Land Fire fighting boots. I must say that this boot is by far the best looking multi-functional Emergency Services boot out there. The boots came out of the box almost field ready. I just had to tighten the boot laces a little. They feel great, might take just a few shifts or a couple days to break in. The only issue I have is it is a little tricky to put the left boot on with a double fracture in the ankle, however, once I got them on and tightened up, the boot was way better than the cast boot I am supposed to wear. Too bad I can’t wear them to bed. Jennifer was awesome, best customer service experience I have had in a long time. She checked clearance and factory seconds to try to find me the best deal, no luck. Another saleswoman Jessica went through her vendor list and connected me to the vendor with the best deals going for the HAIX Airpower XR1. Only down side was I didn’t get the promotional free sample of the Haix socks, I really wanted to try those out with the boots. I did however get an awesome pair of boots that fit perfectly, and for a great price; all to the thanks of a great saleswoman, Jennifer. I now know who to call for my next pair of boots or shoes. 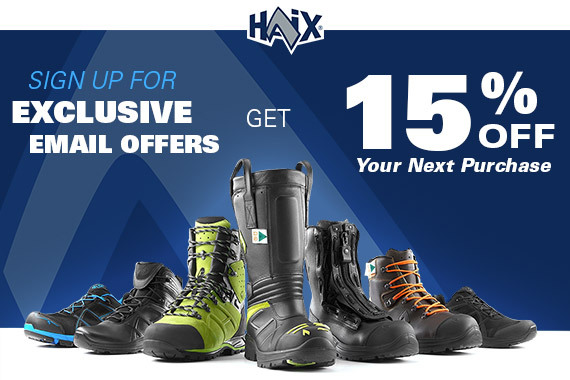 My recommendation, if you have a doubt and want to find the perfect boot to match your needs and size, call the ladies at Haix; they will match you up. Ask for Jennifer! We really appreciate your glowing review of the Airpower XR1. We pride ourselves on excellent customer service and we are happy to hear that our representatives were able to answer all your questions about sizing, products and dealers. We are glad that you were impressed with the look and feel of the boots straight out of the box. Keep in mind, our boots can take a little longer to break-in due to the full grain leather used throughout. Again, we are so pleased we were able to help you out and that we could match you up with the best boots for your needs. We hope they continue to serve you well and that you will remain a loyal HAIX customer in the future. Stay safe out there! Zipper gets caught on the leather strips between the zipper and the tongue! Makes the boot impossible to get off in a hurry. Tried to trim a little bit of the leather away and the nylon that holds the zipper tore! So frustrated!!! We appreciate your feedback on the Airpower XR1. We apologize that you have had issues with the zipper getting stuck, that is very frustrating. That being said, after reaching out to you I believe we have found a solution that will help with the problem. I hope this will not deter you from considering HAIX again in the future. Been an EMT for 2 years. These boots are INCREDIBLE. Not only are they very protective of your feet, they are very comfortable and spacious inside. Make sure you pick the right size boot if you are wide or narrow! Another incredible feature about these boots are the toe room. The description really nailed it when it said there's nothing worse than a pinched toe area when working in tough situations. Having the zipper on the front to quickly get in and out of these boots is also a fantastic feature. I am in love. I look forward to going to work simply to wear these bad boys. We appreciate your feedback on the Airpower XR1. We are so happy that these boots have been working out so well for you and that you like the protection, comfort, easy in/out zipper system and extra room that these boots offer. These boots do run true to size in length but can be a little narrow in the toe box so you may need to go up in width. We hope these boots continue to serve you well in the future. Thanks for being a loyal HAIX customer. Stay safe out there! These boots are exactly what I was looking for. I have been in the Fire service for over 15years, and wasted m6 time with inferior boots. Well worth the money that I spent. Would do it again , and again. We really appreciate you taking the time to review the Airpower XR1. We are happy to hear that these boots are serving you well on the job. We are also glad that you are pleased with the high quality of our products. Thanks for the recommendation and for being a loyal HAIX customer! I just started wearing these highly recommended boots. First shift with them was a 12hr stadium duty, mainly walking, performing HAZMAT sweeps. The rear heal on the left boot is rubbing, but I was told these boots do require a break-in period. I have had no other issue and will say they look great. Thank you for taking the time to review the Airpower XR1. We are sorry that the left boot is rubbing but due to the full-grain leather used throughout this boot can take longer to break-in. But once you do, we believe you will find these to be some of the most comfortable boots you've ever worn on the job. We are pleased that you like the look of the boot and haven't had any other issues. We appreciate your service. Stay safe out there! I have 2 pairs of these great boots, and have been wearing them every 3rd day for 2 years now. I find them comfortable on my 24 hour shifts, and not as heavy as previous boots I have. The leather breaks in after 2 to 3 shifts, and is tolerable during break-in, just wear tall socks. The toe box is pleanty wide, and the exterior to cap is durable. Just don't expect it to shine, as it is not leather. They are "hot" but my feet sweat even in Crocks, so I don't mind. I can wear these with just thin dress socks all day and feel fine. After trimming the extra leather behind the zipper I was able to snug the boot up to suit my comfort. 1st thing is the zipper. The extra leather behind the zipper must be trimmed off for the zipper to work. It sticks out and gets caught in the zipper mechinasm, but if you cut it back it fixes the problem. 2nd is the laces that come with the boot are junk. I think they are cotton, but they broke within 2 months of having the boots. I replaced them with a nylon lace and have had no more problems. Thank you for taking the time to submit feedback on the Airpower XR1. We are glad that these boots are comfortable and lightweight even on long shifts. The break-in period on our boots is a little longer than others due to the full-grain leather used throughout but we appreciate the advice for making it a little easier. To cut down on the sweating, we recommend wearing wool-blend socks which will wick away that moisture, keeping your feet cool and dry. We are aware of the zipper trimming issue, and we do tell other customers to cut it back (without voiding the warranty) so the zippers go up/down more easily. We appreciate your comments on the laces, I will pass along your concerns to upper management for consideration but we are glad that you found a suitable solution for your needs. These boots can be re-soled through our extended wear program. We partner with a company called NuShoe that uses all our manufactured parts to refurbish/resole the boots. You can find out more by visiting nushoe.com. Thanks again for your review. Stay safe out there! My HAIX XR1 boots have worked great so far. They were comfortable right out of the box. I've hiked a bit with them and worn them to the fire station on a number of days... all without any "issues". I picked a boot size equal to my normal shoe size and the fit is "just right". Would give them a rating of 10, but I want to wear them all day on a field day in January in Colorado before I do that. Would highly recommend this boot based upon my experience thus far with the boot. Thank you for comments on the Airpower XR1. We are pleased that these boots were comfortable right out of the box and that they have served you well so far. We really appreciate you sharing your experience so far and for your glowing recommendation. Stay safe out there! The most comfortable work boots that I have worn, I wear these boots for 12hrs while on shift on a 7 day rotation. This is the 2nd pair of HAIX boots that I have purchased in the last 3 years, You get what you pay for and these are great boots, I will be buying these again in 3yrs. We appreciate you taking the time to review the Airpower XR1. We are happy to hear that these boots are the best you've ever worn and that they have served you well on the job. Thank you for your service and your loyalty to HAIX boots! I just bought a pair XR1 boots. They are exactly what I was looking for. These recent pair are actually my 2nd pair as I like to have 2 pairs of boots. I am a Paramedic and have been in EMS for 15 years. I have always worn Eagles (Which are a decent boot and has done me ok. Don't want to knock them too much. ), but when I noticed I would have more occasions of back pain, I narrowed it down to my boots. I switched over to Haix on a coworkers recommendation and I love them! I noticed I can wear these boots all day and into the night of my 24hr shift and my back was doing better. This usually was not possible with the other boots. Haix are much lighter and extremely comfortable. This is exactly why I got another pair, so they last even longer. We appreciate you taking the time to review the Airpower XR1. We are happy to hear that these boots are comfortable and have helped minimize your back pain. I just bought a pair XR1 boots. We are also glad that you liked them so much you ordered another pair. We hope both pairs continue to serve you well in the future. Thanks for considering HAIX . Stay safe out there! sent a pair in to nu shoe for new toe. will never do that again. ruined the leather and the new toe is just a glued on cover that came off in a week. the boots last 1 to 2 years and i wear them everyday. i have 2 pairs i rotate, have owned 8 pairs over last 10 years. only complaint is the zipper sticking and the sole separating from upper. the boots usually fail first at the corners of the toe caps. overall though, a decent boot. very comfortable. We appreciate you taking the time to review the Airpower XR1. We are glad that the boots are comfortable and overall you are happy with the product. We apologize that you had a bad experience with NuShoe and that you were not happy with the repairs. The time span for a boot varies based on how much it's worn, what kind of work you do, and care and maintenance. We appreciate your loyalty to HAIX and hope you will continue to be a customer in the future. I wore Redwing boots for many years. I tried the Airpower a few years ago and now have 3 pairs in various stages of wear. They usually last about a year before I start wearing through the heel. I wore the newest at work, the next newest on days off and the oldest for dirty work and as spares. They have great construction and design. The insoles support the arch well. The only issue is that I can't wear my orthotics in the newest pair because the right boot is slightly smaller than it should be. Thank you for taking the time to review the Airpower XR1. We are happy to hear that these boots have served you well over the past few years and that you have different uses for all three pairs. We are also glad that you like the construction, design and arch support that these boots offer. We apologize that your orthotics don't fit in the new pair of boots because they are slightly small. I assume you ordered the same size as in the other boots, so I am not sure why they don't fit? We certainly hope this doesn't deter you from being a loyal HAIX customer in the future. Stay safe out there! Thank you for your feedback on the Airpower XR1. We are happy to hear that you like the boots. We apologize that you have had problems with the laces/zippers but I am confident that we came to a suitable resolution. We hope this will not deter you from being a loyal HAIX customer in the future. I bought my first pair of Haix because of co-workers praise. Comfortable boot for long shifts but almost immediately had problems with zippers getting stuck when you try and unzip there is a leather flap on the back that gets stuck in he zipper so you have to try and slide you finger behind to get it clear so you can unzip. A real inconvenience, now the zipper pull has broken on the one zipper making it even harder to get them off. Hopefully they can fix this design flaw in the zippers. I love the boots but hate the zippers. Thank you for your feedback on the Airpower XR1. We are happy that you decided to try our boots and are very happy to hear that these boots are comfortable on long shifts. We apologize that you have had some issues with the zippers but I believe we have found a reasonable solution to the problem. Please let us know if you have any further concerns. We appreciate your service and hope you will continue to be a loyal HAIX customer in the future. I'm a second generation, 25 year veteran FF on a City size North East Department. I've used three sets of these boots over the last ten years and they've held up to hot Summers and brutal Winters carrying me through 20+ runs per shift. I've seen all the others and tried most of them. These boots are the Champions and will serve you well. Thank you for taking the time to review the Airpower XR1. WOW! 3 pairs in 10 years that's impressive. We are happy to hear that they have served you well on the job and hold up in all types of weather. We appreciate your service and your loyalty to the HAIX brand! I have had my boots just for over a year I love them a ton but the zippers are really hard to get on and off. Today the zipper pull strap just broke off and shoe lace broke. The toe caps on my boots also started to come part. These are the most comfortable boot I have worn. They are much much cooler then a traditional station boot. It is nice to have the ability to wear these boot on a fire grass fire. Over a good product zipper have some room for improvement. Thank you for your feedback on the Airpower XR1. We are happy to hear that these dual certified boots are comfortable on the job and keep your feet cool and dry. We apologize that you have had so many problems with them, but I am confident that we found a solution that will keep your boots in service for years to come. We appreciate your service and hope you will continue to be a loyal HAIX customer. When I received my boots the first time, there was a small defect on the toe composit. I called the 1(800) number, they explained all I have to do was fill out the form and put the shipping label, that they send you with your boots, put it on the box and drop it off at a FedEx/ ups. It took 8 days and I had another new pair. Put them on zipped them up and have been wearing them ever since. There's really no break in time. I've had the same exact boot before and they lasted me 2 1/2 years. The sole started to part at the side, I glued them but can't wear them for work. But I still wear them for personal work/woods. And my zippers are fine, Never had any problems with the zippers, and that's why I bought them, quick and easy. I do wish it came with heavier shoelaces. The company switched to a thinner sole pad that I did not care for and asked for them to send me a thicker pair with the exchange, which they did and they felt like the first pair I owned. I work for DNR in NE WA for 12 years and wore whites/Hawthorne for years. Not anymore, I'll keep wearing this brand for now on. Love my boots. They feel like ugs with support. We appreciate you sharing your experience with the Airpower XR1. We are happy to hear that our Customer Service Dept. was helpful and that the return process was painless and fast. We are also pleased to hear that the boots were as comfortable as Uggs out of the box and you like the quick on/off feature of the zippers. As for the shoelaces, I will definitely pass your concerns up the chain of command for consideration. Thank you for your service and for being such a loyal HAIX customer. Stay safe out there! At first I was skeptical about this purchase due to the price, but I finally broke down and made the purchase. I have had these boots for over a month now and I can't believe how comfortable they are. The comfort and ease of putting them on make them an easy recommendation for anyone looking to make the investment. We appreciate you taking the time to review the Airpower XR1. We are happy to hear that you have found them to be comfortable and easy to get off and on. We pride ourselves on the materials and craftsmanship used on our boots which makes for a higher price point but we're confident that you'll be wearing these boots for years to come so it will be well worth the initial investment. Thank you for your recommendation and your service. Like so many other have said, "Great boots at first, but then..."
Bought these boots in June of 2014. Pretty comfortable right out of the box. I order the factory seconds after calling and speaking to a customer service rep who assured me that the only reason they would be a factory second is "some minor cosmetic blemish, but nothing more than that." When the boots arrived I noticed tiny voids on the outsold, as if there was air in the mould when they were injected. No big deal. However, within one month there was a split along one of the seams next to an eyelet. I called the customer service department who said I was out of luck as they were factory seconds, and not under warranty. I let it ride, as I wasn't in the position to buy another pair of $200 boots at the time. The laces broke in about 6 months. The toe caps started to separate in about 9 months, and by the 14 month mark, the soles were wearing all the way through to the midsole. I semt them into NuShoe to have them refurbished, and three weeks late they arrived... Untouched, with a letter saying they couldn't be refurbished, but with more explanation why, and a coupon for 15% off my next pair of Haix boots (that I have precisely zero intention of buying). Disappointing all around, Haix. Well I thought they would be great to fit my needs. I am in a Fire Dept in the 7th largest city in the US and do both normal response duties and wildland. 2 years, the stitching coming apart on the uppers, Cracks in the soles and separation from the uppers, soles wear quickly, Zippers appear to be heavy duty but teeth tend to dislodge and break. these boots are in our department commissary at full price and I must say not a fan. Great idea with the multiple certs with zippers but Nope on quality. a 290$ boot should last way longer. Bought these about 2 years ago. Initially, great comfort and insole, break-in was a little rough (took a few days before I could bend my ankle), little warm in the heat but that was expected, in the cold they were comfortable but certainly not winter boots (I live in maine, temps go from 95 in the summer). After 1 year the stitching for the leather loops that the sipper tongue attaches to had pulled apart, the stitching that attatches upper and lower in the area of the ball of my foot where it bends with each step had blown out, i had several area of my heel that had chunks taken oit amd scratches all over the toe cap I sent them out for referb. Upon reciept I could tell nushoe (the haix resoling company) had not changes the heels or toe caps out, utilized even lower quality stitching than before in the areas restitched and left very obvious working mark on the sole from the retread, provided low quality felt insoles, and took 2 months to return the boots. Haix replaced the felt insoles with foam, found to be different than the origionals but I gave them a try. After several months of use, stitching is pulling again, the retreads are pulling from the soles, the leather lower is seperating from the sole, and the redesigmed insole I have found to be profoundly less comfortable tham the origional. In summary, boot was great at first, worksmanship failed too quickly for the cost, resole and refurb not worth the money or time due to extreme poor quality. At the time of purchase there was a one year warranty on the boots to cover manufacturer defects in materials and workmanship. If your problems occurred past the warranty date, then we do recommend having them repaired by NuShoe. I don't know if this was part of the issue but according to NuShoe's policy, toe caps need to be specifically requested, they are not automatically fixed. But we agree that the repairs should have lasted longer than just a few months. NuShoe does stand behind its work and keeps a record of all of their orders. We recommend that you call them and let them know about the issues you had with the repairs and see if they can resolve this matter for you. We apologize that you were not happy with the quality of your boots but hope that does not deter you from considering our products in the future. What can I say about these, I bought these end of July 2016. They wet on a few grass fires but mostly get worn for ststion and EMS calls. It is now January 2017. 2 weeks ago both laces on my left boot broke within a few days of eachother. I dont have them tied tight at all. Yesterday i noticed that part of the seam on the side has come apart (stitches popped) alowing water,dirty,etc. to get in. I dont know if i just got a bad pair or what but other than than they have been great. comfortable, easy zipping. Ill buy one more set but ill leave em in my locker for just wildland use. only because 300$ for a set of boots that get wore out from walking around is hard to swallow. First, I would like to apologize that your boots did not live up to the standard that HAIX prides itself on. But, since you have had them less than a year, they are likely still covered under warranty. If you could please fill out the warranty form, we will do anything we can to help resolve this matter. Thanks for your review and hopefully you'll continue to be a customer in the future. Have had them for over a month, little tough breaking in. But love the fit and construction. As long as they hold out as long as everyone claims in reviews and in my station will be happy. We appreciate you sharing your experience with the XR1. This boot can take a little longer to break in, due to the thick, full grain leather used throughout. But once they do, it will be your go-to boot from now on. We hope they serve you well into the future. Thanks for your service. My guys have not had any problems with this boot. They all like the fact that they can accomplish different tasks without having to change footwear. Great product! Thanks for the feedback from your department on the Airpower XR1. We're glad that your guys have been able to accomplish all their duties in these boots and we hope they continue to serve them well in the future. We appreciate your support! We appreciate your positive feedback about the Airpower XR1. We are happy to hear that they have served you well while working on the ship. Thanks for being such a loyal customer! Outstanding Product. Across the board. Couldn't be happier. Well done Haix. I wrote a very positive review on 8 Apr 2016. It seems I spoke too soon. They lasted a good two years, but my boots are beginning to separate from the soles. Haix and Nusole tell me this is not repairable. I bought these expensive, highly recommended boots hoping that they would last me. I also bought these boots because they were supposedly recraftable. Neither is true. These boots last only slightly longer than cheap, Chinese-made junk. What a disappointment. We are sorry to hear about the issue with your boots. Please feel free to contact our customer service department to see if we can get this issue resolved for you. Can't believe I waited this long to treat my feet right. I work a hard 92 hour work week on the floor. These boots do it all, wither I'm on the box unit, or running on the rig. They keep the aches and pains out of my knees, feet and back. Dont be scared after you first start wearing them as with any new boot, you have to break them in. Once you do that, you will see the benifit; others have voiced their concern over the zip tie on the foot. Me peronsally I dont care as long as its a good boot. Thus far after 2 months hard use, there going strong and I'm very glad I made the buy. I will get back when i get them and have tried them. Ive been a Red Wing Guy, so the money is just a bit more, but if they do what you say then good by Red Wings and hello to my 2 new little friends. I absolutely loved these boots!! Definitely the most comfy boots I have ever owned. After 6 years in the dry hell heat of Las Vegas the leather started to crack and peel and a zipper gave out after the first year. Not sure if I did something wrong or if the leather was to blame. I have since retired them and moved onto a more affordable boot only to be disappointed. I will be buying another pair of Haix as soon an I can scrounge up the cash. Best Station/EMS boots i've owned. I have been in the fire service for 8 years and these boots are the best I have worn. I was hesitant to spend that much money but I am so very glad that I finally did. My department provides boots, but these are well worth the money out of my pocket. Thank you for an excellent product. Will be certain to make another Haix product and continue to recommend them. I bought these 2 years ago for daily wear. Rain, snow, mud, dry, hot, cold - doesn't matter. I was suffering from cheap boot disease (Plantar fasciitis) before, and two years later the pain in my heel is gone. This is a very comfortable, long-wearing boot. Tread is getting a little worn down after two years of daily, on your feet, wear. They were a little creaky until they broke in. The lacing system takes some getting used to, but they will stay laced. You have to learn to point your toe to unzip the boot. The boot comes with a manual - read it! Can't say enough nice things about this boot. Thanks for the great feedback! We're happy to hear how well the boots are working for you.. Comfortable boots. Beware of the thin rubber soles !!! Love this boots. The only downside is the heel. They made the hard rubber so thin and don't last on a 4-10 hour job. The sole is a ripoff. Had them for 2 months and both heel are gone to soft rubber. I have to put a plastic heel protector save them. This boots will not last as compared to other brands. We're sorry to hear about your issue with the heel wearing down. The XR1 sole typically wears very well and hearing a complaint about this is new to us. Please contact customer service at 866-344-4249 as they would be happy to discuss this with you further. I love your boots. I had bought a pair of your Rescue boots back in 2009. I used them till the soles had holes in them. When I needed to replace them I look at may boots from several companies. I once again chose Haix. I purchased a pair of the Airpower XR1's in Aug 2013. I still wear them to this day. Im not on the truck much and I walk in them more than anything else. I did notice that on the left boot the stitching is starting to pop and come open. Not sure what has caused this since I havent been on a truck in 18months. but over all still a great boot. Had these about a week now. Great fit, comfortable right out of the box. Short break in time. I'll have to wear them a bit longer and reevaluate them, but as of now I'm impressed. I have had my Airpower XR1's for about a year and a half now. In that year and a half they have run on about 2000 calls. Mostly medicals, traumas, and a few wildland fires. I wear these off duty as well as on duty, which may be the cause of the wear and tear I have begun to experience. These were hands down, the most comfortable boot to wear out of the box. The break-in time was short, and I have thoroughly enjoyed wearing them. I have run across a couple issues. Firstly, the laces. Three of the Four laces have snapped. The first one snapped about 8 months after purchase. It was an easy fix, and I replaced the laces with Zip ties, a cheap and effective fix. The second issue I encountered was a hole forming just above the sole on the side of one of the boots. Not sure if I struck it on a sharp piece of metal, but whatever the cause, my foot was not damaged. It did however compromise the waterproofing. In conclusion, I would absolutely by another pair. Have not had any ankle injuries with these boots, nor have I had any severe loss of traction on snow or on Ice. I plan on sending them in for a resole and service upon arrival of my new purchase, and cannot wait to get them back. Boot were very comfortable when I first put them on. However the laces always kept loosening. Worst part was every time I would go to take the boots off, the zipper would get caught in the tongue and would not go down. Causing me to unlace everytime. Kinda counterproductive for zip ups. Hi Christopher. We're sorry to hear about your zipper issue. Please call customer service at 866-344-4249 as they would be happy to help resolve your issue. Best Boot I Have Had Yet!!!! Ordered these in 2013 and have been very satisfied with these boots. Very comfortable and durable. Only issue I have had is the stitching but then again they have been to "Hell" and back. I do think that the stitching could be better but then again these have lasted longer than any other boot I have owned. Would recommend these to anyone in Fire and or EMS. Lets see how they are after I get them back from being redone. Great boot!! I've had mine (Medium 9.5 inch) for more than a year. I'm pretty hard on them but they are very comfortable. I like the zipper, how easy my foot slips into the boot, how good my feet feel in them versus another brand I bought but have now given away, don't mind the tie downs, and yes, I've had to adjust my pant leg many times but so what. I've put the shorter version (Airpower R8) but 10 inch Wide on my Wish List and plan to keep the taller version with my wildland gear. I was given these boots 7 years ago to "wear test," and while my fire department didn't end up purchasing them for the whole department, I'm still wearing them every third day. My department purchases us new boots every year, but I refuse to them, because these boots are just as comfortable today as they were the first time I put therm on. I have had zero issues with the stitching. Their is a bit of a brake in period, and adjustment of lacings, but the way I see it, that should be expected with any pair of high quality leather boots. At this point, they could probably stand to be resold. With that being said, I can still wear these all day, and I have zero foot, leg, or back pain. I cannot recommend these boots enough! I cannot say that I would recommend your product or company. You are aware that there is an issue with you product and are choosing to ignore it. Hi Brennan, We are very sorry to hear about the issue with your boots. We strongly believe that Haix boots are among the highest quality boots in the industry, and with a top level Customer Service, we stand firmly behind our products. We would never choose to ignore an issue with our boots or fail to address a concern of our valued customer. I assure you, we take this very seriously. In an effort to make this right, we are repairing your boots at no cost to you. Again, we are very sorry about your issue and apologize for any inconvenience this may have caused. Boot is great, have had it for about 3 months now. I have put it through all kinds of abuse and it keeps going. Only complaint I have is that the toe bunper has peeled off a little bit on one side of the boot. Other than that they are great boots and I hope they will last a long time. Thanks for your feedback, it's important to us. Please give customer service a call at 866-344-4249 in regards to the toe cap as they would be happy to help you. I've had these boots for a few weeks and I like them so far. I wore Chippewa and Redback boots before and Haix are definitely the best of both worlds. They are high (9'') I wish they were 7-8 inches but they give solid ankle support. My only question is are these boots rated for Wildland Firefighting? We are glad to hear that you are happy with your new HAIX XR1 Boots! And yes, they are rated for Wildland firefighting NFPA 1977. I've been wearing Haix for over 6 years now, i have the same boots and i have had every little to no problems with them, at 6 years they are starting to show more wear but still look good. i have never had an issue with zippers or laces as some have had. adjusting the laces took sometime but i did manage to figure it out. Boots are still every comfortable after 6 years of 6 days a week of 12 hr days. boots have been resoled once by Haix. Would definitely recommend. I've only had these boots for a few hours but I can already tell they're going to last a long time. I finally got the laces adjusted to where I want and it changes the fit so much. These boots feel so durable and yet still comfortavle. I can't wait to put some real miles on these boots. I am coming up on my one year since I bought these boots and I had been impressed until recently. Once broken in, the boots were great. They had great traction in all conditions and were very comfortable. They conform to you foot much better then other duty boots I have worn. I use them for station boots, EMS calls, and trail/wilderness rescue. If you spend a lot of time driving an ambulance for more then a few hours at once then I would caution you on these. They tended to make my feet fall asleep as they pinched around the ankles. I recently started having issues with the sewed seams. I now can see my sock through one of the boot seams and the other boot is having the same problem in the same area. For a 300+ dollar boot, I expect it to last longer then a year. Unfortunately, seeing how these boots lasted has made me question whether or not to get another pair of Haix. We are very sorry to hear about the problem with your boots. Please call Customer Service toll free at 866-344-HAIX (4249) as they would be happy to work with you to resolve this issue. I received these boots on 4/30/2015. I read the evaluations mentioning the poor soles, the cable tie, and not fitting large legs. I ordered them anyway based on Haix's reply to his evaluation. When i received the boots, they were just as described. The sole is low quality, it will not fit my legs, no matter how you lace them, and they are held together with a zip tie!! $300 dollars and they can't even turn the zip tie where the tag part isn't sticking out? I don't want to be standing in the ER talking to my medical director, or explaining my treatment to one of the many renowned physicians that I work with while they are looking at my boots made with zip ties. The upper seem to be well made, and the insole is very comfortable, however. I would not recommend these boots to a colleague for every day wear. I hope they make an improved mode with an alternative to the zip tie, a zipper system capable of zipping around larger legs, and possibly switch to a stitch down vibram sole or something similar. I have a few issues with the Air power XR1 I purchased on 02/20/2015. 1. There are many cuts in the outside sole area that's very noticeable and looks like where air bubbles had formed in the molding process . apparently someone knew of the issue as customer service said "many in their stock have the same issue". Now I did not pay for factory seconds, I paid full price for mine and why I was sent these defective looking things I don't know. 2. If you have muscular calf's these will not work properly, and yes I read the long booklet on lacing. But once you get the lacing to fit your foot properly the zipper will not glide up with ease. 3. I noticed they have a zip tie holding together the bottom leather tongue to the boot, something I wouldn't have expected from a $300 pair of boots but yes once i looked back on this website at the picture and sure enough there was a zip tie.4. The tongue is very bulky and top heavy so its hard to get EMS pants over the boot. ( When time is very valuable in our field) you would have to put your pants inside the boot to get to the scene fast which is not an option in our dress code. 5. so that's my opinion on the Airpower XR1 and its company. and I gave it a 2 because it was almost easy to send them back to where they belong on a self in a warehouse. I would have given it a 3 but in the return paperwork it says to send back using FED EX but the mailing stamp in the paperwork is UPS. crazy i know right. We are sorry to hear that you are not happy with your purchase. 1. We are currently looking into your issue with the sole and are discussing with Germany. Thank you for bringing this to our attention. 2. Please be sure to adjust the lacing with the boot already zipped. If you tighten the laces before zipping the boot, your lacing will end up being much too tight. 3. Yes, we use a zip tie to hold the bottom of the zipper to the boot. We assure you, this is not a shortcut, but a simple and easily replaceable solution that works very well. 4. This is the first time we've heard this complaint of the boots with EMS pants. 5. We apologize about the confusion regarding the return label and paperwork. Due to inclement weather, FedEx was not picking up that day so we chose to ship via UPS in order to get your boots to you as soon as possible. We are amending our paperwork to reflect that either UPS or FedEx may be the vehicle by which to return your boots. We appreciate you letting us know of this discrepancy. Customer service has contacted you in an effort to resolve this issue. Comfortable but unnecessarily complex lacing. I agree with most other evaluations, boots are quite comfortable right out of the box. Our whole department was just outfitted with them as wildland fire boots. Nobody, I mean absolutely nobody, has been able to figure out the lacing system to adjust them for personal fit. The boxes included instructions for adjusting the lacing on about 5 models of Haix boots but not for the model that was in the box. All the instructions directed you to a plastic fastening element that does not exist on this model. Don't ever loosen the laces or you will never be able to get them tight again. If I ever have a lace fail (refer to post number 1 above) I don't know how I will ever figure out how to relace it. I can't really imagine doing serious wildland work, miles from civilization with the potential for lace failures. Its been about 6 months now with these boots. Full time EMS system (15k calls per year) boot is comfortable a little on heavy side but I love the boot itself. Like the durability of the boot so far can't say that about laces and zipper. First they take a bit to break in but once they are they feel great. I have noticed if you are just standing around for longer than 30min your feet begin to fatigue quickly. Have had to replace laces already (suggest buying general boot laces ones provided are not durable) HAIX HINT HINT.. Just had to place an order for a new zipper. They could improve quality of zippers. The way they are constructed each tooth is held in its position by being sewn in place. My zipper had the thread break on one tooth and now the zipper is useless. Snow/slush they have horrible traction I will definitely have to get a different boot for winter now. I would upload a pic if I could And back to the laces I had to replace. If you have one blow out while working good luck finishing rest of shift. Over all nice boot but low quality accessories. Thank you for taking the time to provide feedback, Erik. I'm glad to hear that you like your boots but sorry you had an issue with the zipper. Your boots should still be under the 1 year warranty, including the zipper. Please give Customer Service a toll free call at 866-344-4249, or email them at service-hna@haix.com. They would be happy to help you. Thanks again for the feedback, and stay safe! I had airpower X1 (still do) about six years ago... used it heavily in the rainy night, hot summer day, snowy morning and muddy afternoon. First 6 months or so I took care of it but later I hadn't had much interest to clean it as frequently as before (as it happens when things get old I guess lol) but oh man this boots are the beast. They are so comfortable and good looking that I had to get the new XR1 and my feet are never been happier. Get'em & you won't be disappointed. Boots are like walking on air!!!!! Ok so I am not sure where to begin with this review I am not the person who really leaves reviews. For the last 15yrs I've worn numerous of boots and station boots. I go through a lot of boots and then I find myself buying incerts for boots. My heels and feet are always hurting. These boots are the most expensive ones that I've bought. I am not going to sit here and say these are a miracle. But this I will say. I wish they were about 6-8" high instead of 9". However they are comfortable...... The incerts mold to me and no one else they keep the support of my arches, great support around the ankle too. I've noticed that they are a little heavier then normal boots like bates or 5.11, but they seem to be durable. Here is the most important fact....... really no break in time it was minimal. My feet are not hurting as much and I have a lot of mobility and flexibility. I've worn then in a puddle of water, I've worn them in a woodland / brush fire, and so far they lasted and I take a wet paper towel and wipe them clean, they still look new. So if you are wonder how they are cut.... Here is my best advise go try them on directly. NOW PLEASE READ THIS: Sizes: I wear a 11.5 reebok zig shoe, now my bates are 11.5 regular, my 5.11 are 11.5 regular, danners are 11.5 wide, under armor are 11.5 regular, Nike boots I wear 11.5, reebok rezig boot are 11.5, Bellevue combat boot are 11.5 regular THESE BOOTS I BOUGHT HAIX AIRPOWER XR1 I HAD TO GET 12.5 EXRTA -WIDE. Over all I am impressed and think I made a decent investment. I usually spend 3-400.00 a year on boots anyway so let see how well they hold up. If you buy them I think you'll be impressed. I hope this helps. Enjoy your new boots! These are the best boots I have ever purchased and instantly they are comfortable. I had no break in period they relieved most of my back pain that was caused by wearing danners. Work great as a station boot easy to pull on and off and I had no issue with them at a recent brush fire I wore them to. Easy to clean and they hold a nice shine. I won't by any other brand of boot after trying these. Thanks for the great feedback. We're very happy to hear that the boots are working so well for you! In contrast to the rave reviews here, my experience has been different. I wore these boots on a 14 day fire assignment and had to bandage my feet every morning from day 2 on. The length and width of the boots were perfect. In fact, they felt great the first moment I put them on. I used a high quality sock (Fox River). And I loved the zip up/station boot feature. The composite toe is a great safety feature but where its edge meets the boot a bump protrudes into the boot and rubs the side of the big toe raw. This protrusion is less pronounced on the little toe side but will also cause blisters if you do a lot of sidesloping on any given day. The boats were also incredibly hot and the zippers became more and more difficult to work as the boots became dirty. Even after cleaning they became "sticky", especially toward the bottom of the zipper. I contacted Haix about these issues, thinking maybe the boots were from a bad lot, but unlike the responsive help I got with questions pre-purchase, I never heard back. Bottom line: great boot concept but poor execution. Consider another boot. I also bought a pair of Missoulas since I heard good things about them too. But after this experience I returned them unused. I have been in EMS for the last 15yrs and have used may kinds of boots. My first pair of Haix where the Resuce and wore them for almost 4 years till i got a hole in the sole. I couldnt find another pair of the the Rescue boot so i took a chance and ordered the Haix Airpower XR1. These are better than the rescue ones I had. These boots are the best. I have used these in the EMS field and also on my side job at a Nascar track as a fire boot. I couldnt be happier with these boots. I have had these for almost a year now and they sill look as if they where new. These boots are a home run for your feet. My feet are "happy happy happy"
I bought this boot about a month ago, and I am very pleased at it's comfort. So far the boot seems to be breaking in very well and molding itself to my foot, also the structure of this boot is amazing and are not that heavy, I was actually surprised at how light they are. I have previously worn Redwing, Danners Thorogoods, Cat, Carolinas, and Rockwells. These boots by far the best! Close all the tabs on your search engine and buy these boots!!!! You will love them. These are the most comfortable station boot I have ever worn. As a career Firefighter I spend about 60 hours a week wearing these boots and never experience any discomfort. They are also a very rugged boot, i have worn this pair through more than a dozen large wildland fire incidents an they have held extremely well. After two years I can still throw a coat of boot polish on them and they look just like a brand new pair of boots. Bottom line, I will absolutely buy another pair of these boots when they are ready to be retired. Two in One Boot Awesome! This is such a great idea to intergrate a station boot and a wildland boot, someone definitely put some thought into it! Eliminates one more piece of gear and changing step when responding to a brush fire. Very well built and thoroughly comfortable boot, and fairly light weight. The true test will be on my first brush fire, but I'm impressed so far! I bought these boots about a week ago. When I put them on, they were instantly comfortable. I love the light weight but durable construction and the flexibility. I would recommend these boots to everyone. Thanks the for the awesome boots Haix! I'm not typically one that will put up a review on a product but these boots deserve to be recognized. I've been wearing the Haix Fire Hero bunkers for a year now, but had another brand for my EMS/Wildland station boots. A couple weeks ago, after increasing discomfort from my other boots, I decided to give these a try. I'm very glad I did! I have a difficult foot to fit (13.5 narrow) and from the moment I slid them on I knew these were light years beyond my previous boots in quality and comfort. The zippers work flawlessly, the lining feels comfortable and secure around my entire foot. Walking and standing for long periods of time in these is a pleasure! I couldn't be happier. Thank you Haix! This past spring, I received a pair of the new Airpower XR1 Wildland/EMS boots, and agreed to give them a hardy trial run. Prior to my receiving the Airpower XR1, I wore the Airpower R1 boot, and I absolutely swore up and down that they were the BEST boots I had ever owned. I liked the boots so much that I would not only wear them while on the job, but also while off duty. They were simply the most comfortable footwear that I had ever worn; by that I don’t mean just the most comfortable boots, but truly the most comfortable of ANY footwear. With the Airpower XR1, the Airpower R1 now has competition! After a very short “break-in” period, in comparison to most work boots, the Airpower XR1 literally molded itself to the shape of my feet. Not only did it mold to my feet, but it also did an outstanding job of supporting my arches, while maintaining a soft, cushioned padding for the rest of my sole. The mid-boot hugged snuggly to my ankles and low-leg, never to tight, never to loose, offering incredible support to those joints. I have wide feet and the sides of my feet never once rubbed uncomfortably against the sides of the boot. The higher ankle of the Airpower XR1, offered better support and added protection from outside elements. Durability of these boots is second to none. I tend to wear boots out very quickly, leaving me with little ankle support, sore soles, and tattered footwear. Such is not the case with the Airpower XR1 boots. I have put hundreds and hundreds of miles on these boots, and yet they still look and feel just as great as when I first got them. Boots that will hold up to the constant wear and tear of the fire service is no small “feet”. And with the “Recruit to Retirement” boot restoration program, these boots will always be part of my daily PPE. Thank you for making a product of such high quality. Comfort, durability and longevity are nearly impossible to find in a single boot, but Haix has done it again with the Airpower XR1. These are by far the most comfortable boots I have ever worn. Just wanted to let you know, I LOVE my HAIX boots that I got from you. As you know, with my job, I have to be in hard toed boots while at work. I have worn a lot of hard toed boots over the last 10 years. Of late, I have been wearing 5.11 boots and was doubtful that I could do any better. I also have never liked the front zip boots, because they would get hard to zip after the newness wore off. But I LOVE these. I have been wearing them in and out of the refinery and have been keeping them as my "good" boots. So I turned my "good" pair of 5.11 boots into my nasty work boots. At the end of the day, its heaven to slip my feet into my HAIX. I love the front zip and the way my feet slide in. I have had no problems with the study zippers at all. I also love how easy they are to get out of when I'm at my volunteer department. These are by far the most comfortable boots I have ever worn. Thank you so much for suggesting them.